PFC-supported research at JQI has uncovered evidence for a long-sought-after quantum state of matter, a spin liquid. You can’t pour a spin liquid into a glass. It’s not a material at all, at least not a material you can touch. It is more like a kind of magnetic disorder within an ordered array of atoms. 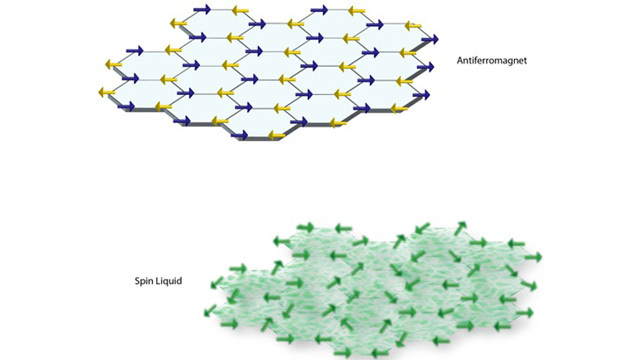 Spin liquids arise due to “frustration,” a baffling condition wherein neighboring atom spins try to anti-align in up-down-up-down fashion, but are prevented from doing so by the intrinsic geometry of the lattice (here, a honeycomb). Understanding frustration and the different ways a collection of magnetically interacting spins can arrange themselves might help in designing new types of electronic circuitry. One compromise that a frustrated spin system makes is to simultaneously exist in many spin orientations . The researchers uncovered a spin liquid when exploring frustration in materials with a hexagonal (six-sided) unit cell lattice. They calculated what happened when a batch of atoms interacted among themselves in an array of hexagons consisting of 30 sites, where the spins are free to swing about in a two-dimensional plane (this kind of approach is called an XY model). They found a “kaleidoscope” of phases that represent the different lowest-energy states that are allowed given a range of magnetic interactions. One of these phases turns out to be a true quantum spin liquid having no order at all. Here, the entire sample co-exists in millions of quantum states simultaneously.